The documentation of the function ODESOLVE in the help should be improved, the examples are confusing the users, because the function definition is missing. Can you please elabote on this by editing your original Product Idea statement? As it was originally phrased this does not appear to be a Product Idea for PTC Mathcad. Sorry, but I am confused by your "product idea". Then you may wish to clarify what you mean by "the function definition is missing" - at least I don't know what you are referring to. In the example you show nothing is missing at all! 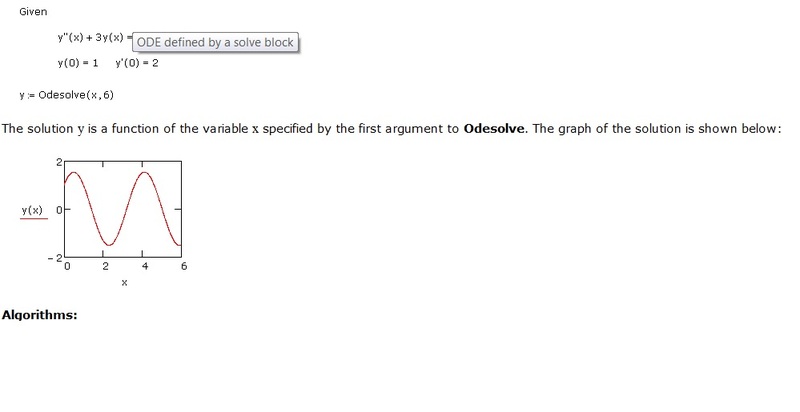 In case you think that you will get a symbolic solution, an equation defining the solution function, the help (some lines above the part you show in your screenshot) clearly states that you will just get a numerical approximation -> "To evaluate this function, Odesolve saves solutions at a number of equally spaced points in the integration interval, and then interpolates between those points using the function lspline." So whats the point of your product idea? Furthermore you should be careful with your wishes! I wouldn't wish PTC to change too much in Mathcad 15. We see in Prime what happens - a mediocre "successor" and a help which dramatically has lost on useability and quality. One last point: when I mouseover your nonexistent avatar it says "PTCEmployee". So I guess you should have other options at hand to put your suggestions, don't you?